Premium trail with marvelous views and idyllic, narrow paths in the middle of a protected natural environment. The German Hiking Institute has certified the Feldberg Climb with its 77 experience points with the "German Hiking Seal". So the Feldberg Climb is a trail with a very high experience value. Basis for the certification are the desires and habits of the hikers, as they are regularly surveyed by studies. For the first time, the German Hiking Seal has succeeded in demonstrating and implementing the diverse elements of the hiking experience in a guaranteed experience. 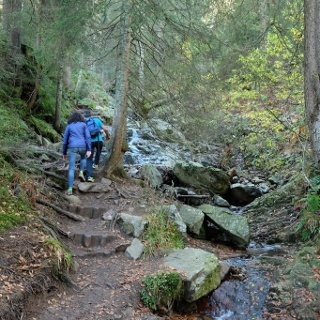 The tour begins in the town of Feldberg, right behind the nature center [Haus der Natur] and starts with a challenging ascent to the Panorama Path. After mastering the first altitude meters, the reward on clear days is a breathtaking view of the Vosges Mountains to the west and the Swiss Alps to the south. Continue hiking to the Bismarck monument to get to the mountain station (1450 m above sea level) and the Feldberg cable car line. Pass by the Feldberg tower and hike through the mountain saddle “Grüblesattel” to reach the Feldberg peak at 1493 m. Take the plunge and begin your descent to the hiking lodges St. Wilhelmer Hütte (or take the alternative route to the lodge Todtnauer Hütte), Zastler Hütte, and Baldenweger Hütte – all of which are refreshing stops along the way where you can rest and have a bite to eat, depending on how tired or hungry you are. Now the actual rise begins − narrow paths, tiny bridges, and an entirely adventurous natural experience! The path leads to a 300 year-old farm in idyllic surroundings, the Raimartihof, where you can enjoy local specialities in its cozy interior. After that, the hike takes you between the 300 m steep slopes of the Feldberg and the lakeshore of Feldsee towards Bannwald. The climb takes you back to the nature center via Karl-Egon-Weg. Zu Begin fuehlten wir uns an den Schinkenweg erinnert, Asphalt und breite Wege, doch dies sollte sich dann sehr vorteilhaft aendern. Leider ist die Beschilderung an manchen Stellen nicht so, wie man sie sich wuenschen wuerde, doch kann dies natuerlich auch an Souvenierjaegern gelegen haben. Ohne GPS Track haetten wir uns hier und da ganz schoen verlaufen. Den Stern Abzug gibt es fuer die einem "Steig" unwuerdigen Streckenabschnitte. Dennoch ist er durchaus empfehlenswert. Allerdings finde ich die Einstufung "schwer" doch etwas zu hoch gegriffen. Auch ist die angegebene Zeit mehr als gut bemessen, Wir haben mit Pausen 4 Stunden und 15 Minuten gebraucht. Sehr schöne Rundwanderung. Persönlich bevorzuge ich zuerst zum Feldsee und den Abschluss auf dem Berg.